Please accept my blessings. I thank you very much for your inquisitiveness shown in your letter dated Jan. 30, 1968. And I am sorry that I could not reply this letter earlier, on account of being busy in my preoccupation. I am glad that you attended our class at Montreal and tried to understand the philosophy of Krishna Consciousness. It is neither sectarian nor dogmatic. It is the natural relationship of the living entities with the Supreme Soul. The Supreme Soul is Krishna, or the All Attractive; one cannot be Supreme Soul without being all attractive. If God is Supreme, therefore the nomenclature of God to be addressed is Krishna perfectly well. 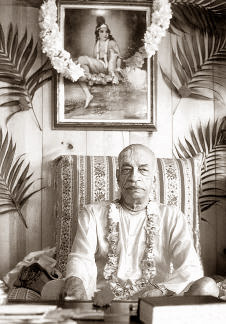 time devotee, it is the question of devoting oneself sincerely to Krishna Consciousness. To prosecute Krishna Consciousness there is no limitation, no material impediment can stop progress of Krishna Consciousness. That is the symptom of spiritual life. Spiritual life doesn't depend on material conditions. We have got many instances from the history of devotee's life as Prahlad Maharaj. He was a small school boy, his father and teachers were all against God Consciousness. Still he flourished and converted all his class fellows to be Krishna Conscious in spite of severe trials experimented on his personal body. So it is only the question of understanding the process how to execute Krishna Consciousness. If you can therefore spare some time to live with me, it will be better. You appear to be a very intelligent boy and I hope you will learn the art quickly.